Engineering studies have two systems contributing side by side to the enhancement of comprehension and study skills. The first is the theoretical systems; conducted primarily in the form of lectures, tutorials and labs, which are accompanied by frequent consultation of various knowledge sources. The second is the practical system, in the form of Industrial and Research Training, during which the students apply theories learnt. 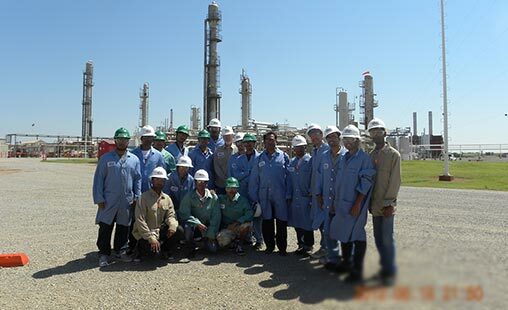 The third year B.Tech students are scheduled to go through Oil & Gas Industrial and Research Training, envisaged with a view to make students familiar with industry operations in Oil & Gas industry including exploration, drilling, production, transportation, refining, distribution, electricity, generation and research activities. The ultimate goal of the training is to accelerate integration into professional careers once the graduate is hired for doing a certain task. To enhance student’s scientific and practical capabilities. It makes the student perceive the practical signification of the academic topics handled at the faculty, and direct his thinking to the practical aspects. To give the student, the feeling of a professional career he/she is heading for, before graduation. Industrial and Research Training can represent a valuable asset for the graduate and for the employer. For the latter, post-hiring training can be sensible shortened.